Process Capability. Variability Reduction. Statistical Methods. Statistical Methods of Process Control focus on the measurement and analysis of process performance, with a view to creating an accurate and useful measure of the current situation, identifying sources of variation impacting on the process output (i.e. the product or service being produced) and eliminating variation with a view to consistently and repeatedly producing the desired output. Statistical Process Analysis converts process performance into relatively simple visual control graphs and control measures. The visual nature of statistical analysis is one of its key strengths. unfortunately the requirement to collect data on a routine basis, plus some of the mathematical requirements can deter people from considering the use of statistical analysis in process improvement. However, a good understanding of even the basics of statistics, can allow very good process capability analysis and the implementation of very effective process controls. Implementing Statistical Process Analytical Methods of Improvement. 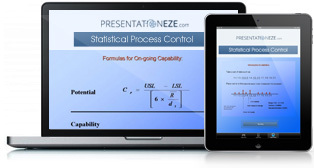 Statistical Process Control. Statistical Techniques. You need to understand the differences between common and special causes of variation, you will need to be able to perform some relatively simple mathematical calculations and to create control charts. As part of the set-up and ongoing control, you will want to perform capability studies. You will need to understand the statistics behind Cp, Cpk, Pp and Ppk, which are broadly similar to those behind the X-bar and Range charts. Once you have set-up and are implementing statistical measures, you will want to start to interrogate the results you are seeing. You will need to be aware of how to identify trends, also to know if and when the control points are appropriate. An understanding of the benefits and drawbacks of statistical analysis will be useful, to ensure you optimize the benefits, while avoiding some of the risks associated with the application of statistics as part of process control and optimization.